Built in 1885, the Middle Bay Lighthouse in Alabama's Mobile Bay, is an example of a common screw-pile lighthouse. The Seven Foot Knoll Light was built in 1856 and is the oldest screwpile lighthouse in Maryland. It was initially installed on a shallow shoal, Seven Foot Knoll, at the mouth of the Patapsco River. The northern reach of this river is the Baltimore Harbor, where the now-decommissioned lighthouse has been placed as a museum. The Thomas Point Shoal Light is a historic lighthouse in the Chesapeake Bay on the east coast of the United States, and the most recognized lighthouse in Maryland. Carysfort Reef lighthouse, four miles east of Key Largo, Florida, was built in 1852 and is the oldest screw-pile (with disk) lighthouse still in service in the United States. Screw-pile lighthouses on the reefs in Florida are tall skeletal towers, with living and working quarters set high above the reach of storm waves. Fowey Rocks Light, built in 1878, is seven miles south of Key Biscayne, Florida. 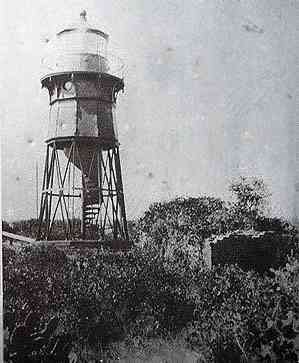 American Shoal Light, completed in 1880, is located east of the Saddlebunch Keys, in the Florida Keys. Gasparilla Island Light, built in 1890, is located in Boca Grande, Florida. Working on getting SHPO to approve project!